Tony from Tonys GuestHouse just emailed us about the newest upgrades done to make visitors even more comfortable in his guesthouse hotel. 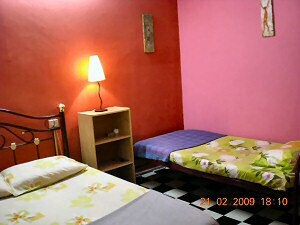 Read what we think about this good and cheap guest house in our previous post about Tony’s guest house. 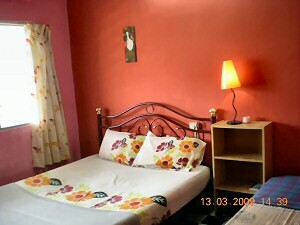 As the pictures show, the rooms in Tony’s guesthouse got a new coat of striking colours. Most importantly, there are now mosquito nettings on all the windows of the rooms. Tony says no to dengue fever, so do I and so should you! Most travelers do know that mosquitoes can cause malaria and yellow fever and most likely your doctor gave you a jab for that before you came to Malaysia. Malaria and yellow fever were the jabs my doctor wanted to give me, but I declined. Why? 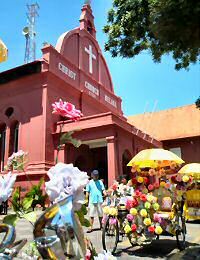 The mosquito borne diseases here in Malaysia are dengue fever and chikungunya. Both caused by the zebra striped aedes mosquito. Dengue and chikungunya are virus infections without a cure, without a vaccination and dengue fever can be lethal. Dengue fever destroys your blood platelets, meaning your blood becomes thinner and thinner until you bleed to death internally. Surviving dengue is a race between your body’s immune system killing the virus before it kills you. The second time I got dengue: only after one week of headaches I saw the typical red rashes and went to the hospital (Gleneagles Hospital Kuala Lumpur) immediately. The same day I got a blood transfusion to get my platelet count up again and all went well ever since. Better be safe and sorry: you are safe from mosquitoes at Tony’s guesthouse due to all the new mosquito nettings Tony put on each of the huge windows. This keeps mosquitoes out but improves ventilation big time: it’s the same as what we do in our own house. I have seen lots of other cheap hotels and expensive accommodations without mosquito netting and I can only say: that’s not a wise thing to do. Further on no need to go to Starbucks: wifi connection is available now in Tonys guest house and it’s free as well.